Basic Water Needs B.V. is happy to announce that our Tulip water filters are now available in Tanzania. Water Filter Tanzania, led by Rephrin Kombe, is the official distributor of Tulip water filters in Tanzania. 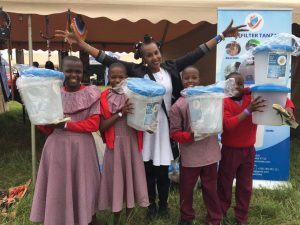 From the city of Arusha, she is able to deliver filters all over Tanzania. With a background in marketing, she support local agents in the promotion of safe drinking water and Tulip water filters. 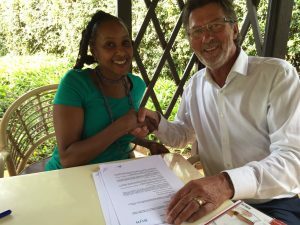 In her short time as a representative of Tulip water filters, she has already trained many local agents, including the agents in our ‘Carbon credits for safe water’ project. She also had a chance to bring the Tulip filters to the attention of the former Tanzanian minister of Tourism and Natural Resources at the Karibu Fair in Arusha, Tanzania. Please see this great experience here. For more information on purchasing Tulip filters in Tanzania, please contact us at info@basicwaterneeds.com. We will bring you into contact with Water Filter Tanzania.